Images provide visual information and reinforce learning. It's easy to add pictures to Articulate Quizmaker quizzes. In Slide View, go to the Insert tab and click Picture. In Form View, go to the Home tab, click Media, and choose Picture from File. Browse to the image you want to use, and click the Open button. To insert multiple images at the same time, hold down the Ctrl key while selecting the images with your mouse, and then click Open. 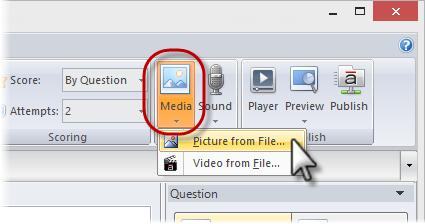 Tip: You can also drag and drop pictures directly from Windows Explorer onto your Quizmaker slide when you're in Slide View. After importing an image, you can move, resize, crop, format, and animate it.